Underground Graphics have sponsored some highly modified show and cruise cars in the past few years and we felt it was time to support a different area of our customer base this year. 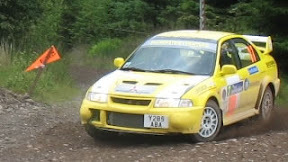 2008 sees Fraser Jones and his rally prepared Mitsubishi Evo 6 as our main sponsor vehicle. Recently Fraser finished 12th overall on his four wheel drive debut in the Dumfries based Scottish Rally. A disappointing starting position of 37th meant that Jones had to struggle with rapidly deteriorating road conditions over his higher seeded competitors costing vital time in the forests around Dumfries. The first stage proved difficult as Fraser and new for the event co-driver Gavin Miller had to get used to each other and the car. Nevertheless emerging from the stage in 14th position would prove to be a strong start to the day. With the first stage behind them the crew settled in readiness for stage 2 and adopted a more considered approach. Showing great promise they emerged with the equal first placed time in their class. Throughout the day the crew were catching slower competitors costing vital seconds in three of the six stages. The majority of the time being lost in the final long stage Ae North when they were stuck behind a slower Subaru Impreza who refused to pull over for the final few miles spoiling what was a thoroughly enjoyable stage. The team performance grew throughout the day as they became more comfortable with the new more powerful car. The times were consistent but masked the overall improvement as they were nursing the car with a rapidly deteriorating gearbox which had no 4th gear for four of the six stages. A fantastic event with superb stages gave the crew a great opportunity to learn the new car. It was the first time Jones had competed in a left hand drive car, first time in a 4 wheel drive car, first time with new co-driver Gavin Miller, first time with the backing of Underground Graphics and it was rewarded with a first in class stage time….on stage 2.